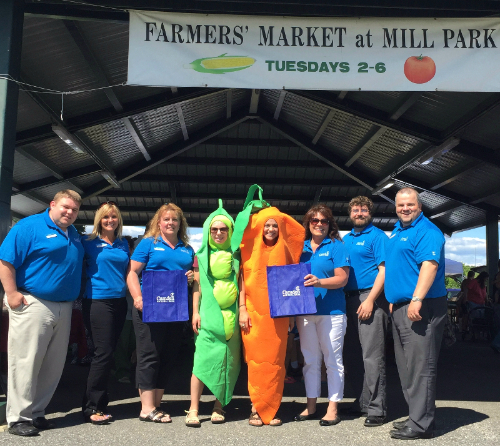 September 8, 2016 - Camden National Bank partnered with Central Maine communities this summer to help raise awareness and resources for local food pantries. 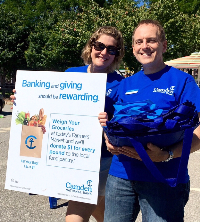 During the months of June, July and August, employees from the bank’s Augusta, Gardiner, Lewiston and Waterville locations attended their local farmers’ markets to help their neighbors raise funds to fight food insecurity in their areas. The bank set up at table at select markets, handed out reusable tote bags to shoppers, and offered to weigh their grocery purchases. For every pound of food a shopper purchased, Camden National Bank pledged to donate one dollar to a local food pantry. In total, market shoppers ended up raising $2,000 to help fight hunger in central Maine. Employees from Camden National Bank in Waterville are joined by representatives from the Waterville Food Bank at one of the August markets. (Pictured L-R): Food bank volunteer, John, and operations manager, Sandra Hammond; Amber LaPierre, Christina Gagnon, Stephanie Purnell and Virginia Gleich (in back) from Camden National Bank. Camden National bank employees from the Augusta area pose with a pea and carrot from WIC at the Augusta Farmers’ Market in July. (Pictured L-R): Wes Huckey, Donna York, Trisha Harriman, Brookes Smith (pea), Janessa Smith (carrot), Nancy Tracy, Wes Littlefield and Brent Vicnaire. Through the funds raised from these donations as well as those delivered earlier in the summer through its employee-run community outreach program, the Community Spirit of Giving, Camden National Bank hopes to provide meals and support to the more than 208,000 individuals in Maine who currently turn to food pantries and meal service programs for food assistance every year. In addition, through grassroots efforts like these and partnerships throughout its local communities, the Bank seeks to provide assistance to underprivileged children and families and help prevent hunger throughout the state. For more information on Camden National Bank’s philanthropic and community efforts, visit here. Camden National Bank is a full-service community bank that offers state-of-the-art online and mobile banking resources through a network of 63 branches and 85 ATMs in Maine, as well as lending offices in Massachusetts and New Hampshire. Headquartered in Camden, Maine, the Bank has been supporting Maine’s people and businesses since 1875 and believes in creating strong connections to the community through volunteerism, sponsorships, and donations that strengthen and invigorate the areas it serves. Through programs like Hope@Home and the Community Spirit of Giving (CSOG), Camden National Bank partners with local agencies to provide vital assistance to those in need throughout the state. To learn more, visit here. Member FDIC.